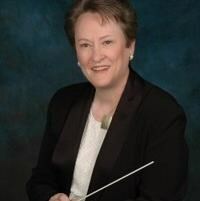 Pauline (Tina) Anderson is currently the Music Director of the Musikfest Chamber Orchestra and Ensemble and was the founder and former Music Director of the McLean Youth Orchestra (MYO), Repertory Orchestra and Chamber Ensembles. She has consistently produced outstanding musical performances while exhibiting a caring interest in each musician in the youth orchestra. Ms. Anderson was educated at The Catholic University of America, Rice University, Shenandoah Conservatory of Music, George Mason University, and has performed in a master class for Leonard Slatkin, of the National Symphony Orchestra. Ms. Anderson’s conducting teachers include, James De Preist, Dr. Robert Ricks, Anthony Maiello and Col. Arnald D. Gabriel and her two masters teachers were Mary Ann Stabile Cooper (vocal) and Jacob Blatt (violin). She studied music liturgy at Virginia Theological Seminary, and was a professor at Northern Virginia Community College (NVCC). Ms. Anderson plays on a 1740 Italian Cremonese violin by Vincenzo Panormo. She teaches in Springfield, has recorded for the Williamsburg Collection, and is the founding member of the professional Musikfest Players. She served on the Board of the American Symphony Orchestra League. She received the 2003-2004 Kennedy Center Award for the People to People Project and was recognized for organizing orchestra programs in Peru, Colombia, Haiti and Honduras. Ms. Anderson holds the Order of the Grand Croix from Germany and was awarded the Order of the Thistle by the Knights of the Garter for her community service. Ms. Anderson received the Master Teacher Award from the Potomac School. She has been appointed Virginia State String Chairman for the Virginia Federation of Music Clubs (VFMC) for the next two years. In October 2011 she was awarded the Distinguished Alumni Award for Professional Achievement from Shenandoah University. Ms. Anderson comes from a long line of musicians, including her second cousin, Cole Porter. Request Lessons with Tina Anderson today!